We have not posted in a while now, because very little is happening in the way of travel. Since arriving back in Florida from Charlena's surgery we have been sitting in Green Cove Springs just taking a few day trips down the St. John's River. We are taking this time however to do a major refit of Sail Quest. What was supposed to be a $30,000 upgrades are more like $40,000 as we are approaching the finish line. But the results are amazing. The new hardtop bimini is finished and installed. 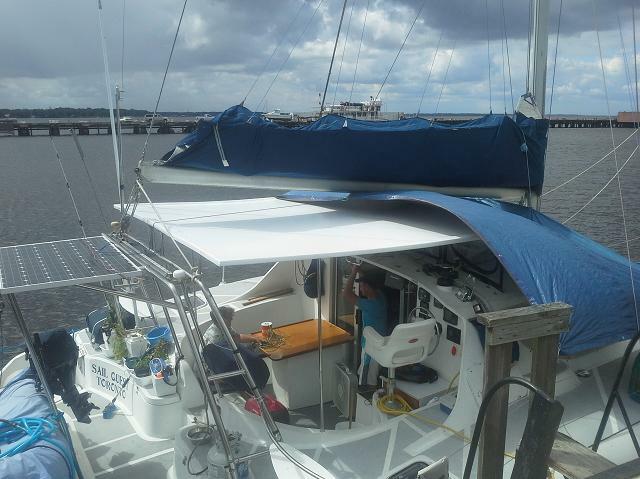 When we purchased her, Sail Quest had a semi-rigid hardtop bimini over the cockpit. It was made from a product called "starboard" which is a type of plastic. It worked at keeping the sun off of the cockpit area, and kept the area drier, but frankly looked cheap and wasn't up to my standards. So the old hardtop has been removed and we have a new fiberglass hardtop. This new top will allow us to walk on it so we can go up to the boom to get the mainsail ready. It also works as a rain-catcher to collect fresh rain water. Over 10 square meters in size means just 1 cm of rain will catch 100 liters of water. 2.5 cms of rain (1 inch) will fill our tank from empty. The new hardtop also has new lighting. The old outdoor lighting consisted of a single small fixture that provided enough light to sit and talk, but not enough to read a book. The new lighting is dazzlingly bright and can be dimmed to give us the amount we desire. Around the outside of the hardtop is a remote controlled light strip that allows us to change not only the brightness, but also the colour of the lights. The new hardtop will sport new sun shades off the sides as well. There were some sun shades (grey... ugh) on the old hardtop. They were attached on in 4 places, and tied to the lifelines outside with bungee cord. To extend them you had to untie 5 cords, roll them out, and then tie them out in 4 places. The new ones that I have designed and am having made are in a bright cheery yellow. They have a rigid pole on the outer edge so rolling them up is easy. Plus to store or extend them you only have to clip the pole at both ends to the lifelines on the side of the boat. We will also have a new sun shade for the front deck that is easy to setup and take down as the current one is such a pain to set up that we rarely use it. While we are at it, we are repainting the deck to white. The current grey colour (what's with all the grey...) makes it way to hot to walk on once the sun comes out. We are also making upgrades to nearly every major system on the yacht. New LED lighting throughout the boat, in both white and red. The red is so that at night time it doesn't ruin your night vision. You will be able to see your way inside, and when you go outside your night vision will still be excellent. The lights are so much brighter than the old style boat lights that were there. Plus, since the lights stretch the length of the room their lighting is diffuse and not from a single point. This does two things, first it allows the lights to be brighter yet doesn't hurt the eyes to look at them, and second it means there are no shadows. Each bedroom is being fitted with USB outlets for charging electronics. We have a new Bitstorm Badboy Xtreme MJ long-range wi-fi antenna. This system allows us to get wi-fi internet while we are out cruising, with coverage at ranges of up to nearly 10 kms from a wi-fi hotspot. This gives us full internet access while travelling and even while in remote bays and islands. Onboard we have our own wireless network which shares the internet and also allows access to our huge selection of music and videos (see the post on Entertainment). We have replaced the small 12 volt fridge that came with the boat with a 120 volt side-by-side fridge/freezer. The exterior is stainless and black and looks much better. A while back a boat was arriving in the marina and I helped grab their lines and tie them up. It is something most people do and is a common courtesy among boaters, but as a way of saying thank you, they gave us their left-over 1/2 bag of ice. Well we had survived without ice since selling the house last fall, but once we had it again we were hooked. We have been purchasing bagged ice every few days since then, but now we no longer need to. We have purchased an ice maker that produces over 12 kg of ice per day. Enough ice for all the drinks we want. To help with our increased electrical usage we have upgraded the solar array to 1300 watts, and added a top-of-the-line Rutland 1200 wind generator. This will produce about 15 kWh per day, or 450 kWh per month of free electricity. For both security, and for convenience when returning to the boat at night, we have installed motion detector lighting around the boat. Four motion detectors detect movement around the boat out to 50 meters. These will then ring a buzzer inside, and can automatically turn on the 5 new floodlights that are going around the boat. There is also a siren attached to the system which we can have on or off. This will help with security when we are away from civilization should anyone decide to come visit during the night. We found that while out sailing we saw a great many amazing things, from dolphins swimming with us, manatees, flying fish, giant sea turtles, sharks jumping, and every manner of bird. But in nearly every instance by the time we grabbed a camera it was over and we had missed it. Well no longer. We now have 4 high resolution (1080p) video cameras that record night and day. It is all saved to a storage unit in the boat. If anything happens now we will have a video of it, and just have to tell the system to save what it recorded. After a week or two, if we haven't told it to save it will delete and write over with new. We can also expand the system with 4 additional cameras when we are ready. We would like to have one camera at the top of the mast looking down at the boat, but that will wait until the next time we take the mast down. We have upgraded the navigation system as well. We are very happy with our existing Raymarine auto-pilot so we purchased a new Raymarine chart-plotter/navigator. The huge 18" touch screen display shows our position on our chart, and we can plot our course just by tapping our destination on the screen. This system will then calculate a complete course, and update our auto-pilot which will then drive the boat for us. We have a new top-of-the-line Quantum Wireless Radar which will be mounted on the back left corner of the boat. This will feed colour radar images to our display unit, showing other boats, navigation items (bouys, shore, etc.) as well as the most important, weather. The radar can see rain over 50 miles away and displays it on our screen so we can set our course to avoid bad weather. The new CHIRP sonar not only finds fish, it also measures the depth of the water we are in. This system then records that and saves it to create depth charts that are overlaid on our maps. A neat benefit is that the depth charts that we automatically make are uploaded to the Raymarine servers, and we automatically download charts made by other boats. Why is this important? Many people don't realize it, even most boaters don't realize it, but the majority of the charts in the world were made over 100 years ago. Even the more "recent" ones of 20 years ago didn't use GPS. So while your new GPS units will tell you exactly where you are (to within a meter), the old charts could be off by dozens of meters. This gives a false sense of security as you look at the charts and see that you are staying 10 metres away from a rock, when in fact the position on the chart could be wrong and you are actually on top of the rock. With this new shared data however the old depth charts will be replaced by new, constantly updating depth data. I moved the VHF radio outdoors at the helm. This way I can reach it and make volume adjustments on the way. We found that with it indoors and having the outdoor speaker it was always too quiet or too loud and finding the right balance was nearly impossible. Where the VHF came from in the salon left an opening, so we installed a new Rockford Fosgate stereo there so that it is easily accessed. A brand new stainless steel barbecue has been mounted on a new stern rail, and it will attach directly to the boats propane system (instead of having its own tank on the rear deck). This will free up space and look better too. Plus it is easier to access from inside the cockpit area, making cooking safer and easier. For playing we picked up a bunch of new toys. We purchased a Tiki Breeze Island. This large inflatable island is 4 meters long and 3.1 meters wide. It has seating for 5 adults and loungers for two more. A built-in swim up platform, 2 ice buckets, and a center well to soak your feet. This is where we will be spending the hotter parts of the afternoon, on the island, underneath our catamaran. Kyle has his new kayak, an 11' Emotion Kayaks Envy, and is enjoying it immensely. Both Charlena and I have tried it out and we'll be ordering our two new kayaks before we leave here. We have an underwater video camera for when scuba diving, or just to lower over the side on a pole. It can also be used on any of the kayaks since it is waterproof. We have a large parafoil kite for playing in the breeze while sailing or at the beach. At over 1 meter, it's large enough to carry up the video camera to get some aerial shots too. We still have the drone as well, but this will allow un-attended recording. Kyle also has 2 complete sets of new scuba gear. Each set has a metallic blue Catalina aluminum 80 cubic foot tank. The first set, Kyle's primary, is a ScubaPro Nighthawk BC with Air II. This is fitted with a Mk II S360 primary and secondary regulator. There is no "octo" as the back-up air supply is built in to the BCD, eliminating the extra hose dangling around. The set rounds out with a wrist mounted dive computer. The second set is Kyle's back-up, or a guest set for people coming to visit. He will be a fully certified diver before we head out to the Bahamas. That is our next destination. We will be heading over around the beginning of October. In the meantime, Kyle will be taking a trip to Alaska in August for a week. Our friends Bobby & KJ on S/V Leona Jane need to head home for a week to get their house ready for selling. Kyle will be going along to help out and see some sights. Once everyone returns we are going to leave Green Cove Springs and head to St. Augustine (or maybe somewhere further south). September will see Charlena and I back up in Canada to help our eldest daughter, Jenn, with the arrival of our first grandchild. Once we return it's Bahama-time!